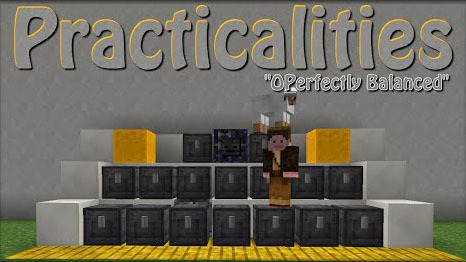 Practicalities Mod is mostly designed to pleasure players with its simple and practical functionality. Luminus Rod: An item that when right clicked will place an invisible light source on the ground. Recharge it by placing it in a crafting grid with a Radiant Charger. Rare Earth Magnet: Get all the Stuff and Things! Will pull XP orbs and Items directly to your inventory, and will work through walls. Refinery: A simple early game way to double your ore output. Requires more fuel, but has a chance of providing and extra ingot. You can also recycle your tools and armor in it as well. Matter Transporter: No one knows how it works, but it is capable of moving blocks from one location to another. Imbued Sword: An old powerful weapon capable of defeating any foe. Imbued Tool: An almost magical tool capable of making work faster and more efficient. Wither Farm: A way to automate the killing of the Wither boss.